The full moon has long been considered a symbol of wisdom and intuition. We feel its connection every month when it lights the night sky. Many of us feel more energetic and alert during the full phase of the moon. This is partly because our bodies and mind are intricately connected to the lunar cycles. 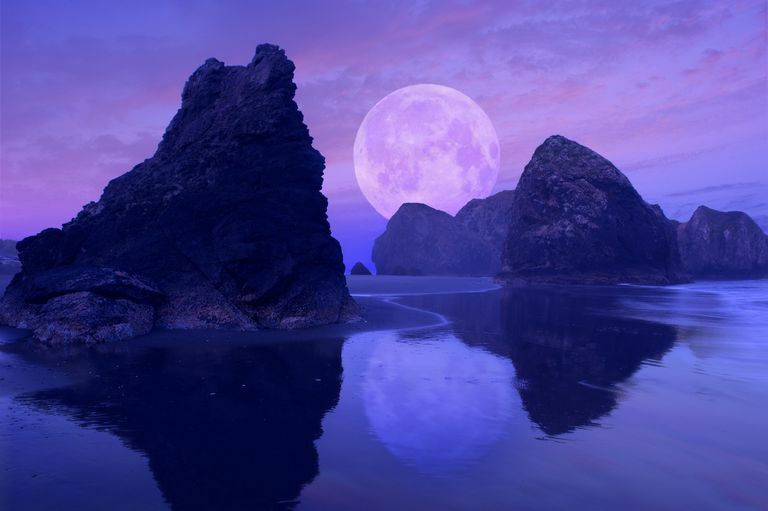 Like our selves, water is also linked to the changing face of the moon -- just ask anyone who lives on the coast about the phenomenon of "lunar tide"! Using a reflective surface as a tool for scrying is hardly new -- the ancient Romans did it in their religious rituals, and the Egyptian "Book of the Dead" contains references to Hathor's magic mirror, used to see the future. Pre-Christian Celtic seers were believed to have visions when they looked upon dark stones such as beryl or other crystals, according to Pliny. Even in the 1500s, Nostradamus made notes about staring into a bowl of water by candlelight to gain inspiration. This divination is one of the simplest. It's best to do it outside if at all possible, because, after all, you are relying on the moon to illuminate the water for you! If you can't perform this ritual on the night of the full moon, the night immediately before or immediately after is just as acceptable. If your tradition normally requires you to cast a circle, do so now. If you'd like to play some music, go ahead and start your CD player. Sit or stand comfortably at your workspace. Begin by closing your eyes, and attuning your mind to the energy around you. Feel the soft earth under your feet. Hear the rustling of the wind in the trees. Breathe in the scent of grass and earth that lingers in the air. Raise your arms out to your sides, palms facing up, and feel the energy of the moon above you. Take some time to gather that energy. It's a pull, a palpable sensation that we can feel if we just take the time to look for it. Feel that silvery power above you, and recognize your connection to it, and to the Divine. When you are ready to begin scrying, open your eyes. Notice the night all around you. You may feel an unusual sense of clarity and alertness - don't be alarmed, it's just that lunar energy at work. Raise the pitcher in one hand, holding it over the bowl. As you do, visualize wisdom and guidance within the water. As you pour the water into the bowl, from the pitcher, see the energy of the moon charging that water. Recognize that this water can show you the mysteries of the moon. When the bowl is full, position yourself so that you can see the moon's light reflected directly into the water. Stare into the water, looking for patterns, symbols or pictures. You may see images moving, or perhaps even words forming. You may have thoughts pop spontaneously into your head, that seem to have nothing at all to do with anything. Use your journal, and write everything down. Spend as much time as you like gazing into the water -- it may be just a few minutes or even an hour. Stop when you begin to feel restless, or if you're getting distracted by mundane things ("Hm, did I feed the cat?"). When you are finished gazing into the water, make sure you have recorded everything you saw, thought and felt during your scrying session. Messages often come to us from other realms and yet we frequently don't recognize them. If a bit of information doesn't make sense, don't worry -- sit on it for a few days and let your unconscious mind process it. Chances are, it will make sense eventually. It's also possible that you could receive a message that's meant for someone else -- if something doesn't seem to apply to you, think about your circle of friends, and who it might be meant for. Afterward, you can leave your water out overnight to charge it even more, or you can pour it away into your garden as an offering. ** Note: If you live near a natural body of water such as a pond or lake, you can perform water scrying with these larger "bowls" instead!